Filling in the glaring gaps. 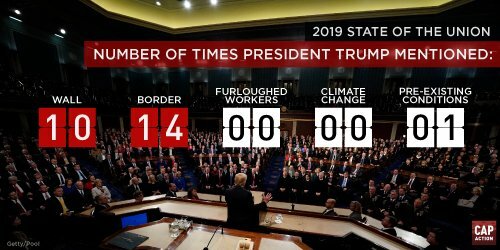 President Trump’s State of the Union speech was many things. Unremarkable. Divisive. Insincere. A bit weird. Trump failed to mention the furloughed workers whose paychecks he held hostage for 35 days. He didn’t mention climate change, one of the most dire issues facing our world. He mentioned pre-existing conditions exactly once, promising to protect them even as his administration is actively suing to rip them away. He did, however, manage to threaten Democrats to drop the investigations into his corruption. Tip: Begging to avoid accountability for your own corruption isn’t a selling point with most Americans. Trump ignored several vital issues in last night’s SOTU, including climate change and gun violence. House Democrats are picking up the slack. Hearings were held today about the climate crisis and gun violence prevention. Both hearings were the first on these topics in many years and are key examples of House Dems keeping their campaign promises to the public (unlike Trump). Today’s hearing on gun violence in the United States was attended by many Parkland parents and included a moving statement from Rep. Lucy McBath (D-GA-06), who lost her 17-year-old son to gun violence. In contrast, some Republicans are blindly taking the president’s positions, rather than doing the work to address these crises head on. Rep. Matt Gaetz (R-FL-01) used his platform to champion Trump’s wall, rather than addressing the gun violence epidemic. He also threatened to have a parent of a murdered Parkland student removed from the hearing room.